As I sit here sipping my tea, staring out the window at the first dreary day in weeks, I'm wishing I were back in Ferryland, sitting on the cliffs, enjoying a Lighthouse Picnic. 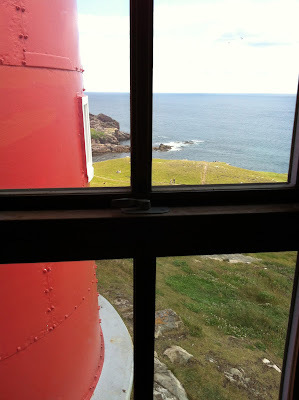 The Lighthouse Picnic is something the hubby and I have wanted to do for ages now, and it's something I've personally wanted to do since first seeing it on 'Places to Go with Sharon Snow', way back when it first opened. So after years of hearing nothing but great reviews, and working through photo envy of friends who have gone, we finally got around to booking our own picnic. I gotta say, we loved it! The Lighthouse Picnic is definitely something to be experienced by everyone, whether you're from the province or just visiting. While searching Pinterest for some summery treats, I came across these quick and simple frozen banana pops (originally on the blog Recipes under 400). I like them because you can literally make them in ten minutes, and you don't have to wait a day or more before you can eat them (one of the reasons I've yet to make homeade ice cream - I'm more of an instant gratification kinda gal). I also like the fact that they're customizable; the original recipe called for plain greek yogurt to be flavoured with cinnamon - I opted for vanilla greek yogurt and cinnamon coated praline pecans. It's really up to you, on how you decide to make them, you can even spruce them up with some chocolate chips, or toasted coconut, or both?! Which now that I suggest that, I'm wondering why I never thought of it earlier! I made two different versions of this treat (only because I ran out of the praline pecans and needed to improvise). Option 1 was me improvising with chopped almonds and brown sugar, while Option 2 is the Praline Pecan version. Brace yourself for one of thee most AMAZING scalloped potato recipes you've ever had. I'm serious. You're not gonna believe the flavour of these things. I admit, they're not the prettiest things you've ever seen, but the taste is out of this world. I've made it a couple of times now and each time I'm blown away by how good it is, in fact my hubby told me today that I make, and I quote 'the best scalloped potatoes ever, in the world!'. In the meantime, I may be able to pull off the recipe well, but the real praise goes to The Looneyspoons. Thanks again for yet another amazing dish! Fried rice is something I've always enjoyed. Not only is it easy to make (and fast), it's completely customizable to your own taste. The combinations are endless! Use whatever veggies you have in your fridge, any kind of dried fruit, and you can even throw in some nuts or seeds. Overall, it's great to have with any meal as a side, and it's always a crowd pleaser! With that said, picky eaters do exist, so if you have someone in your family who prefers plain rice versus this variety, do what my mom has always done for my sister - prepare the rice as you normally would (I suggest keeping the raisins in the mix), then set some aside before preparing the fried version. I stumbled across this recipe on Pinterest, like many of my recipes these days. The original post came from Witty in the City, but I've also seen it referenced as 'World's best chicken' by Rachel Schultz. Either way you make it, it will be delish I'm sure, because it's the flavour combo that makes this taste so good. Here's another recipe brought to you by turkey leftovers. 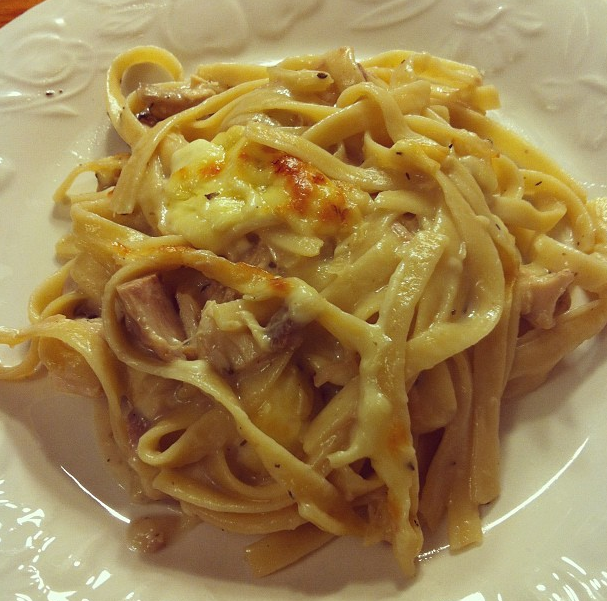 This is a great dish to serve to family and friends, it has every level of comfort you could ask for - turkey, cheese, creamy sauce and noodles - everyone will be satisfied. Hey Everyone, I'm happy to report I've just crossed another item off my Food List Challenge - Eggs Benedict. Now you may be wondering how I've gone this long without trying it, and after devouring it this morning I'm wondering the same! Truth is, I didn't think I liked hollandaise sauce... boy was I wrong. The Paula Deen inside of me was jumping for joy as I was cutting more and more butter into the sauce. Overall, I must say it was delish! Though, after messing up one pot of sauce, poaching the eggs (my first time might I add) and ensuring everything was timed properly, the next Eggs Benny I eat will be at a cafe. With that said, the Eggs Benedict brings me half way to my summer goal for the Food List Challenge: 5 new foods down, 5 new foods to go! Turkey Casserole just happens to be one of my favourite post-turkey-dinner meals. Not only is it super easy to make and involve very little prep, it's also great at getting rid of leftovers.